Not all nuts are created equal, and I learned something on my Argonaut that I am now using on my Aquanuat LV. Both use 17 mm metric nuts, four at each bulkhead. But the 2002 Argonaut seems easier to put together then the 2008 Aquanuat, with which I have to use a wrench or vice grips every time when I am putting the pieces together to hold the bolt head (inconveniently located on the other side of the bulkhead in the other section). When paddling today, I noticed that the new kayak has lock nuts like the one pictured on the left. 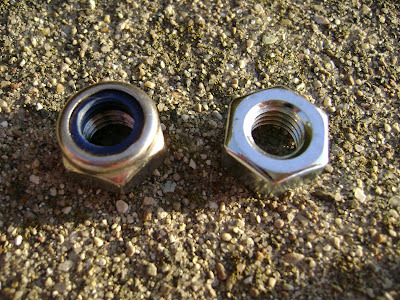 Lock nuts have a thin blue ring within the nut that literally bears down on the threads, preventing it from loosening. The older kayak has a standard nut, like the one on the right (notice , no blue ring). It uses a lock washer instead under the nut, but that seems optional. The point is, I changed out all locking nuts with non-locking nuts and what did I find? MUCH easier to put together. The bolt head now really doesn't turn, and if it starts to turn, I simply give the ratchet a little "impact", or sudden turn, and it cinches the bolt down in the other compartment neatly. In addition, should I ever forget or lose the 17 mm wrench, I can now screw the nut on by hand! That is not possible with the lock nut because of the blue ring creating force against the threads. (One day I will secure all nuts by hand only and paddle and let you know if it's successful). The question will be if the nonlocking nut (and I did not add lock washers) will loosen as I paddle. This is hugely unlikely as there is really no motion between the two interlocking kayak segments, but I will tell you if it does. Let's all get a new set of nuts! On our sectional Valley Aleut II tandem kayak, I have replaced the bolts and nuts by cam levers and knob nuts. Now I don't need to bring any tool. Simply turn the knob nuts on the bolt, and on the other side tension the cam levers by hand. As there are small rubber washers on all bolts, the bolts will not retract, and the knob nuts are connected with rubber cords to the boat. So I can never lose a part. It works great.